Six years ago, I tossed my Dell Laptop out the window, went to the Apple store and bought my first MacBook Pro. Now, another MacBook, an iMac, two iPads and four iPhones later... I can barely remember what the Blue Screen of Death looks like. It strikes me as funny that Microsoft chose to "upgrade" it! If you are or ever were a Windows user, you’re likely familiar with the Blue Screen of Death (BSoD). The bug check screen, with its lines of error codes, has been part of Windows since version 1.0. It has represented the crashing of computers — and the frustration of users — for decades. The BSoD was never intended to be user friendly, though. It was made for engineers who wanted to figure out why a PC crashed. For the rest of the world, it signifies the downside of owning a Windows device. The iconic Stop Error screen is getting a facelift with Windows 8. The redesigned OS also includes speed and stability improvements, a Metro interface optimized for touchscreens and an app store. The new BSoD doesn’t include all of the bug checks or lines of code that have defined the error screen for years. 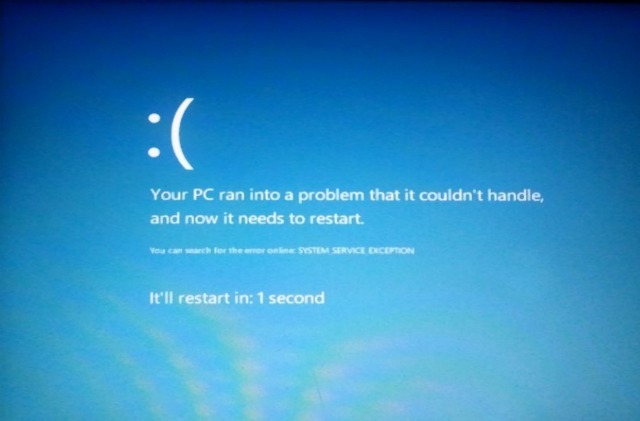 Instead, the Windows 8 BSoD includes a giant sad emoticon and a simple message that “your PC ran into a problem” and that it has to restart. We’re fans of the new error screen — it’s much clearer and more user-friendly — though we hope there’ll be fewer chances to see it. But we want to hear your thoughts. Do you like the new Blue Screen of Death? Let us know in the comments.